Employees assist customers at the new DMV Express office in Stamford, Conn. Wednesday, Nov. 28, 2018. Located on Henry Street, the office is open Monday through Friday and provides a range of services by appointment only as an alternative to the full-service DMV in Norwalk. STAMFORD — Going to the Department of Motor Vehicles office may become a lot more convenient for local residents, as a new “express” office opened on Wednesday. The South End office location isn’t changing, but it will now be open five days a week. The center, which had been open only twice a week, will now be run by The WorkPlace, which operates the American Job Center in Stamford. 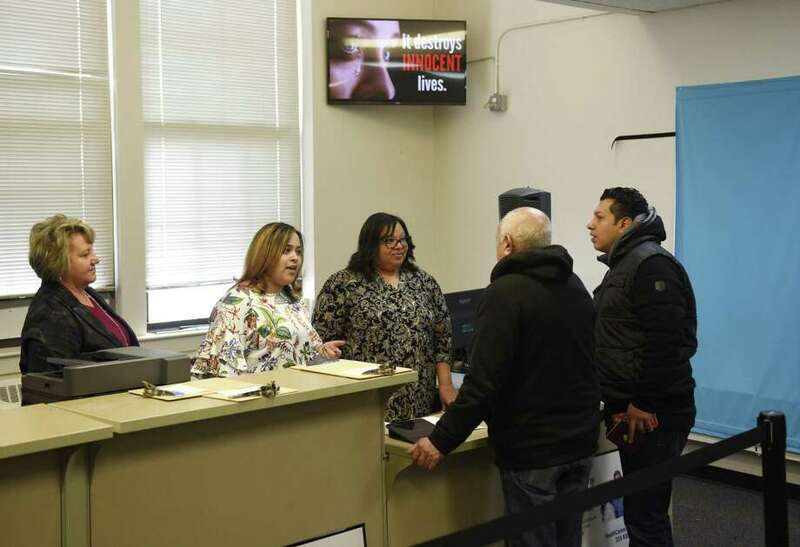 As part of a public-private partnership with the state, The WorkPlace charges an $8 service fee to Stamford DMV customers per transaction, while the state DMV gets to recoup employees from the center for it’s larger Norwalk hub office. The Stamford location, however, will remain a limited-service DMV. Services at the center are restricted to renewals and alterations of driver’s licenses and identification cards for U.S. citizens and non-citizens. Tom Long, vice president of marketing and communications for The WorkPlace, said limiting the types of services helps keep the operation running smoothly. “Where this really helps out is that license and identification renewals are high volume, low impact as far as time and effort,” he said. “We do really help move people through and serve customers … and help unclog the main offices that are doing the heavy lifting. Michael Bzdyra, commissioner of the state DMV, said more days were added to the Stamford center to better serve customers. The state has opened similar private-public partnerships in Milford and West Haven, and Bzdyra said the convenience fee hasn’t been a major hindrance, since customers seem content to pay extra to get services close to home. Anand Ranganathan, a Stamford resident, was trying to get his license renewed on Wednesday. He said the fee wasn’t a deal-breaker for him, but it was pricey. Ranganathan said he had to wait for more than an hour the last time he visited the Norwalk DMV, which is the closest full-service center for Stamford-area residents. Myrleine Albert wasn’t aware of the new express offerings and went to the office Wednesday for information about getting her license renewed. Her timing was perfect and she was able to renew her license in just a few minutes. “I was shocked … and then everything went well,” she said. However, Albert was fortunate to be accepted as a walk-in. DMV officials stressed the center will operate under an appointment system with walk-ins turned away unless there is an opening. Stamford previously had a full-service DMV on Magee Avenue that closed in the mid-1990s. A limited-service DMV was later opened in the government center. That location was also closed about 10 years ago, due to parking issues and an effort from state administration to consolidate services at the Norwalk location. The Stamford DMV is located at the Lathon Wider Community Center at 137 Henry St. The center is open 9 a.m. to 5 p.m. Monday to Friday and until 5:30 p.m. on Thursdays. All customers are required to make an appointment in advance through the DMV’s website.